There are a number of Novenas to Blessed Saint Jude, and within those Novenas, a number of ways to say them ~ those of which I will list here. I was raised Catholic, though my spirituality now is a rather eclectic mix. I still pray novenas the way I learned, such as: pray the novena 9 times consecutively with each followed by 1 “Our Father”, 1 “Hail Mary” and 1 “Glory Be” each day, prayed for 9 consecutive days. The praying of 9 times per day in one sitting for 9 days stems from the 9 days the Apostles prayed together during the time between Jesus’ Ascension and the Pentecost. At the end of your novena, it is customary to publicly thank your Saint for their help and guidance. This is particularly true for Saint Jude. Before the Internet, people used to take out a “Thank You” notice in the paper, which some still do. In this day and age of the Internet though, there are many sites (this being one) wherein you may publicly extend your thanks. Spreading the love far and wide via social media, such as Facebook and Twitter are also great ways to send one’s thanks. 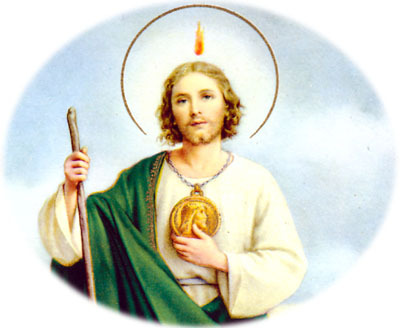 This entry was posted in Saint Jude and tagged 9 Day Novena to Saint Jude, Apostle Saint Jude, Catholic Novena, Catholic Novenas, No Fail Novena to Saint Jude, Novena, Novena to Saint Jude, Novenas, Saint Jude Thaddeus. Bookmark the permalink. MARIA SS LAURETANA WE NEED A MIRACLE .PLEASE HEAR OUR PRAYERS AND KNOW OF OUR DEVOTION TO YOU. WE ARE SO DESPERATE. PLEASE LET MOLLY’S BIOPSY BE NEGATIVE. PLEASE INTERVENE. PLEASE ST JUDE HEAR MY PRAYERS. PLEASE DON’T LET OUR MOLLY HAVE CANCER . OH,MOST BEAUTIFUL FLOWER OF MOUNT CARMEL,FRUITFUL VINE,SPLENDOR OF HEAVEN.BLESSED MOTHER OF THE SON OF GOD;IMMACULATE VIRGIN,ASSIST ME IN MY NECESSITY. OH,STAR OF THE SEA,HELP ME AND SHOW ME YOU ARE MY MOTHER. OH,HOLY MARY MOTHER OF GOD,QUEEN OF HEAVEN AND EARTH,I HUMBLY BESEECH YOU FROM THE BOTTOM OF MY HEART TO SUCCOUR ME IN MY NECESSITY. THIS IS NO JOKE OR MADE UP POST MY LOVE LEFT US IN JAN OVER A MISUNDERSTANDING (BOTH OF OUR FAULTS) AS I APOLOGIZE AND BEGGED OR HIM TO RETURN WE WOULD NOT BUDGE AND CONTIUED TO SHUT ME OUT AND MOVE ON WITH HIS LIFE HEART BROKEN FOR MONTHS CRYING.I WOULD NOT GIVE UP.NEVER HEARING ABOUT NOVENA BUT VERY MUCH SPIRITUAL, I CAME ACROSS MY FIRST ONE ST JUDE (WHICH I KEEP HIS CANDLES ALL THRU MY HOUSE NEVER KNOWING ABOUT SAID NOVENAS)I DECIDED HEY I COULD USE A LIL HELP ILL START ONE OR TWO WHICH I DID ST JUDE,INFANT JESUS,HOLY SPIRIT AND MOTHER THERESA AS I WAS LOSING HOPE. TWO WEEKS AND TWO ST JUDE TWO INFANT JESUS AND COUNTLESS MOTHER TERESA’S MY LOVE CAME BACK. HE DOES FAVORS IN HIS OWN TIME BUT HE IS ALWAYS ON TIME. please let me receive my early retirement within this next week, my heart is broken and I am so despaired, I can not sleep, I am not feeling well I pray St Jude for your assistance. Asking for St. Jude to help Ali get into NYU – her dream, make it happen!